In the UK, someone takes their own life on the railway every 36 hours. But suicidal thoughts are often temporary – and interrupting them with a simple question can be all it takes to start someone on the road to recovery. 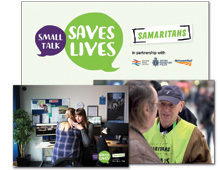 ‘Small Talk Saves Lives’ was borne from this insight, and set out to encourage members of the public to take action if they saw someone in distress by showing that even a simple question about the weather can be enough to disrupt someone’s suicidal thoughts. At the heart of our campaign was a filmed public service announcement with a twist, telling the real-life story of a woman whose life had been saved by a passer-by who took time to stop and talk. We seeded this emotional video through social media, mainstream news, outdoor advertising and even on train concourses. The results were overwhelming, with over 4 million views of the film to date, and 315 pieces of media coverage. Most importantly, we’ve already started to hear stories of those who have intervened on platforms…and potentially saved lives. Small Talk Saves Lives was based on a simple insight, but that was what made it strong: talking can help prevent suicides. It was ambitious in its goal and use of multimedia and employed a social media film and signs at stations, which engaged multiple stakeholders to raise awareness, with the ultimate aim of reducing deaths.